Due to the Slovak GDP growing very strongly from 2000 until 2008 – e.g. 10.4% GDP growth in 2007 – the Slovak economy was referred to as the Tatra Tiger. Since the establishment of the Slovak Republic in January 1993, Slovakia has undergone a transition from a centrally planned economy to a free market economy, a process which some observers were to believe was slowed in the 1994–98 period due to the crony capitalism and other fiscal policies of Prime Minister Vladimír Mečiar's government. While economic growth and other fundamentals improved steadily during Mečiar's term, public and private debt and trade deficits also rose, and privatization was uneven. Real annual GDP growth peaked at 6.5% in 1995 but declined to 1.3% in 1999. Two governments of the "liberal-conservative" Prime Minister Mikuláš Dzurinda (1998–2006) pursued policies of macroeconomic stabilization and market-oriented structural reforms. Nearly the entire economy has now been privatized, and foreign investment has picked up. Economic growth exceeded expectations in the early 2000s, despite recession in key export markets. In 2001 policies of macroeconomic stabilization and structural reform led to spiraling unemployment. Unemployment peaked at 19.2%  (Eurostat regional indicators) in 2001 and though it has fallen to (depending on the methodology) 9.8%( or 13.5% as of September 2006, it remains a problem. Solid domestic demand boosted economic growth to 4.1% in 2002. Strong export growth, in turn, pushed economic growth to a still-strong 4.2% in 2003 and 5.4% in 2004, despite a downturn in household consumption. Multiple reasons entailed a GDP growth of 6% in 2005. Headline consumer price inflation dropped from 26% in 1993 to an average rate of 7.5% in 2004, though this was boosted by hikes in subsidized utilities prices ahead of Slovakia's accession to the European Union. In July 2005, the inflation rate dropped to 2.0% and is projected at less than 3% in 2005 and 2.5% in 2006. In 2006, Slovakia reached the highest economic growth (8.9%) among the members of OECD and the third highest in the EU (just behind Estonia and Latvia). The country has had difficulties addressing regional imbalances in wealth and employment. GDP per capita ranges from 188% of EU average in Bratislava to only 54% in Eastern Slovakia. In 2007, Slovakia obtained the highest GDP growth among the members of OECD and the EU, with the record level of 14.3% in the fourth quarter. In 2014, GDP growth was 2.4% and in 2015 and 2016 Slovakia's economy grew 3.6% and 3.3% respectively. For year 2018, National Bank of Slovakia predicts raise of GDP by 4%. Foreign direct investment (FDI) in Slovakia has increased dramatically. Cheap and skilled labor, a 19% flat tax rate for both businesses and individuals, no dividend taxes, a weak labor code, and a favorable geographical location are Slovakia's main advantages for foreign investors. FDI inflow grew more than 600% from 2000 and cumulatively reached an all-time high of, $17.3 billion USD in 2006, or around $18,000 per capita by the end of 2006. The total inflow of FDI in 2006 was $2.54 billion. In October 2005 new investment stimuli introduced – more favorable conditions to IT and research centers, especially to be located in the east part of the country (where there is more unemployment), to bring more added value and not to be logistically demanding. Foreign investment sectors – industry 38.4%; banking and insurance 22.2%; wholesale and retail trade 13.1%; production of electricity, gas and water 10.5%; transport and telecommunications 9.2%. Foreign direct investment " on green field"
Slovak service sector grew rapidly during the last 10 years and now employs about 69% of the population and contributes with over 61% to GDP. Slovakia's tourism has been rising in recent years, income has doubled from 640 million USD in 2001 to 1.2 billion USD in 2005. However, this sector still remains underdeveloped in comparison with neighbouring countries. 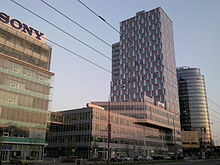 Slovakia became industrialized mostly in the second half of the 20th century. Heavy industry (including coal mining and the production of machinery and steel) was built for strategic reasons because Slovakia was less exposed to the military threat than the western parts of Czechoslovakia. After the end of the Cold War, the importance of industry, and especially of heavy industry, declined. In 2010, industry (including construction) accounted for 35.6% of GDP, compared with 49% in 1990. Nowadays, building on a long-standing tradition and a highly skilled labor force, main industries with potential of growth are following sectors: Automotive, Electronics, Mechanical engineering, Chemical engineering, Information technology. The automotive sector is among the fastest growing sectors in Slovakia due to the recent large investments of Volkswagen (Bratislava), Peugeot (Trnava), Kia Motors (Žilina) and since 2018 also Jaguar Land Rover in Nitra. Passenger car production was 1,040,000 units in 2016, what makes Slovakia the largest automobile producer in produced cars per capita. Other big industrial companies include US Steel (metallurgy), Slovnaft (oil industry), Samsung Electronics (electronics), Foxconn (electronics), Mondi SCP (paper), Slovalco (aluminum production), Hyundai Mobis (automotive), Continental Matador (automotive) and Whirlpool Corporation. In 2006, machinery accounted for more than a half of Slovakia's export. In 2016, agriculture accounted for 3.6% of GDP (compared to 6.9% in 1993) and occupied about 3.9% of the labor force (down from 10.2% in 1994). Over 40% of the land in Slovakia is cultivated. The southern part of Slovakia (bordering with Hungary) is known for its rich farmland. Growing wheat, rye, corn, potatoes, sugar beets, grains, fruits and sunflowers. Vineyards are concentrated in Little Carpathians, Tokaj, and other southern regions. The breeding of livestock, including pigs, cattle, sheep, and poultry is also important. According to a recent report by the European Commission, Slovakia (along with some other Central and Eastern European economies) is low on the list of EU states in terms of innovation (Slovakia ranks 22nd). Within the EU, it ranks next to last on knowledge creation and last for innovation and entrepreneurship. In the process of transition to a knowledge economy, it particularly lacks investment into education and a broader application of IT. The World Bank urges Slovakia to upgrade information infrastructure and reform the education system. The OECD states that a stronger product market competition would help. In March 2006, the Slovak government introduced new measures to implement the Action Plan for R&D and Innovation. The program covers the period from 2006 to 2010. The RDA is expected to launch at least one call for the expression of interests related to this program each year. The annual budget for the program will be set by the RDA. The overall amount available for the program depends on annual national budget resources and is likely to vary from year to year. Following an increase of around 50% in budget resources, the RDA disposes of a total budget of €19.31 million in 2006. The minimum wage in Slovakia is set at 520 € per month, the average salary for 2017 was 1052 € per month, in the Bratislava region in 2017 the average salary was €1527 per month. As of February 2018 the unemployment rate stood at 5.88%. Graphical depiction of Slovakia's product exports in 28 color-coded categories. Slovakia switched its currency from the Slovak crown (SK-slovenská koruna) to the Euro on 1 January 2009, at a rate of 30.1260 korunas to the euro. ^ a b c d e f g "CIA World Factbook". CIA.gov. Central Intelligence Agency. Retrieved 7 January 2019. ^ "Ease of Doing Business in Slovak Republic". Doingbusiness.org. Retrieved 2017-11-21. ^ "Export Partners of Slovakia". CIA World Factbook. 2012. Retrieved 2013-07-24. ^ "Import Partners of Slovakia". CIA World Factbook. 2015. Retrieved 2017-06-25. ^ "Public debt". cia.gov. Central Intelligence Agency. 2017. Retrieved 18 December 2018. ^ "Scope affirms Slovakia's credit rating of A+, Outlook remains Stable". Scope Ratings. Retrieved 23 February 2018. ^ "GDP growth (annual %)". data.worldbank.org. World Bank. Retrieved 8 April 2019. ^ "Gross domestic product in the 4th quarter of 2007". Statistical Office of the Slovak Republic. 4 March 2008. Retrieved 2008-02-14. ^ "Slovensko kraľuje výrobe áut vo svete, dosiahli sme nový rekord" (in Slovak). HNonline. 2017-01-17. Retrieved 2017-06-25. ^ "Minimálna mzda 2018". Minimalnamzda.sk. Retrieved 1 March 2018. ^ "Priemerná mzda". www.minimalnamzda.sk. Retrieved 1 March 2018. ^ "Rozloženie platov v Bratislavskom kraji – Platy.sk". platy.sk. ^ "Nezamestnanosť ďalej klesá, bez práce je 5,88 percenta ľudí". ekonomika.sme.sk. Retrieved 1 March 2018. ^ "CEE Basic Data - Key economic indicators and forecasts". Ceemarket.com. Retrieved 3 March 2015.